The Advocacy Project requires a substantial amount of commitment from the teacher, students and parents involved with the project. Although the results of The Advocacy Project are stunning, being highly organized with students from the very first day by implementing The Advocacy Project requirements in the syllabus and presenting the project within the first month of school is a must. I break the project down for students into manageable steps to ensure that all students have the resources they need to be successful in completing The Advocacy Project. ¿DÓNDE? Throughout Baltimore City. Service may be completed anywhere within the city limits, preferably with a Latino community within Baltimore City. ¿CÓMO? 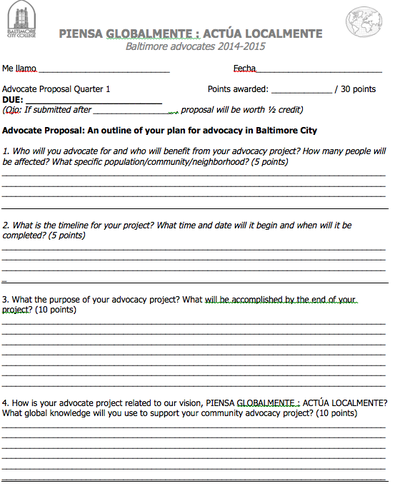 Students will propose and develop their own community advocate project, to be completed by September 26th, and reflected upon by January 8th, 2015. Students will strive to be advocates for the Latino Community in Baltimore to complete the project requirements, but may also be advocates by promoting an initiative of their own design within the school, in their local community or within a church or local organization. ¿CUÁNTO VALE? This is a 200 point project for Quarter 1 (Formative), and a Summative Assessment for Criterion C and Criterion D for Quarter 2. 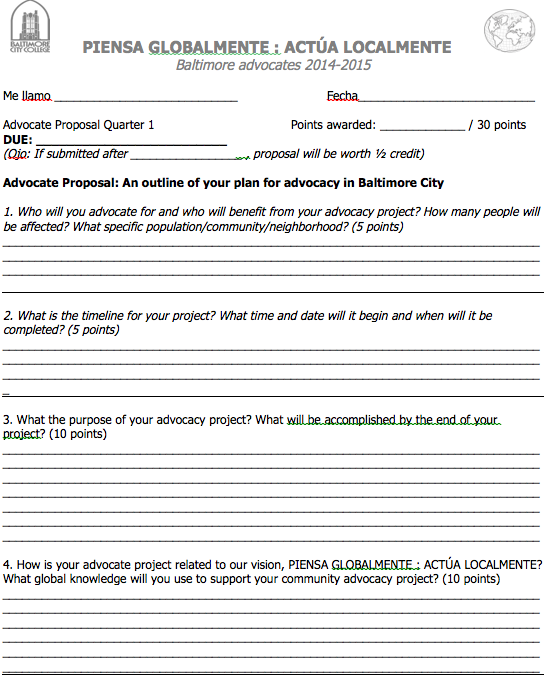 30 Points: An outline of your plan for advocacy in Baltimore City for Quarter 1. 20 points: This will reflect your time spent on the project, a signature of a supervisor, andat least one photo of the work completed that day. 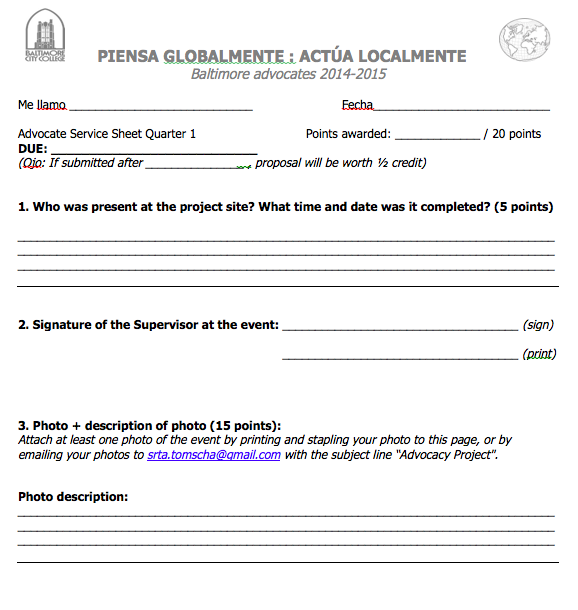 Criterion C/D Summative Assessment Essay: You will reflect on your project(s) and your impact as a leader and advocate that “thinks globally and acts locally” by writing a five paragraph essay IN SPANISH (minimum 250 word count) with a thesis, paragraph and conclusion. Will be graded on a MYP Criterion C/D rubric and will reflect on your advocacy, reflection and connection of our class vision to your work. 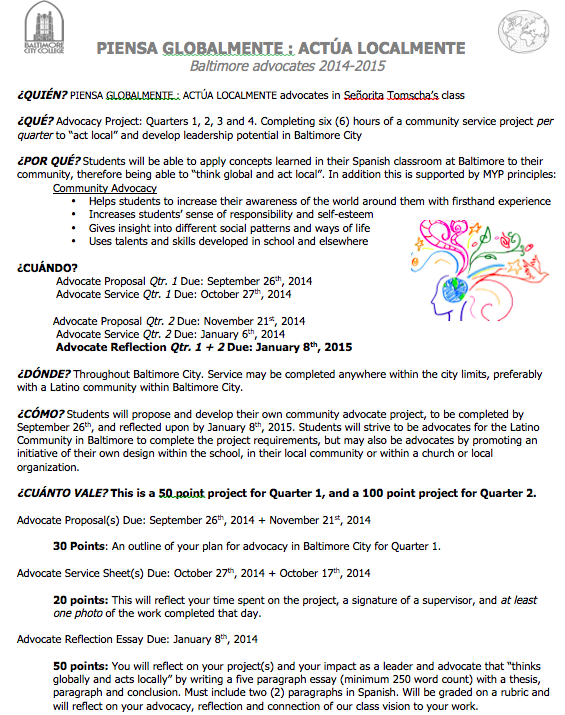 Below I have included an example of the "Advocate Proposal" and the "Advocate Service Sheet."